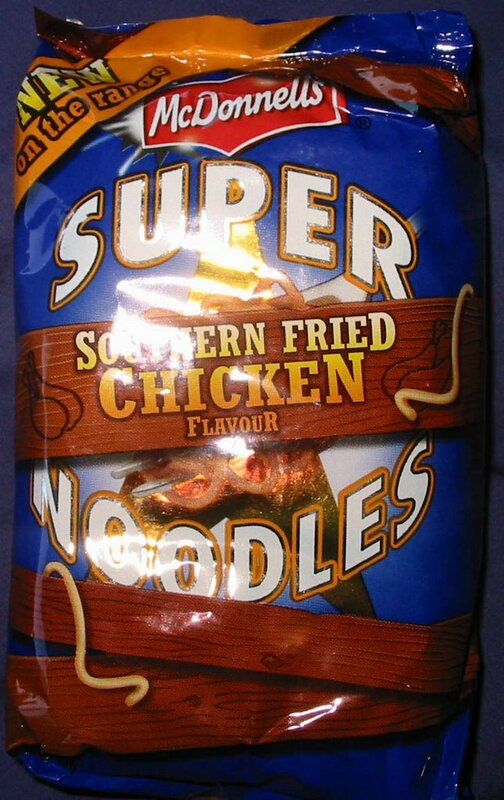 This offering from Super Noodles is a new addition to the line, just like the Spag Bol flavour. This is shown by the "NEW on the range" slogan in the corner. I'm not really sure what Southern Fried Chicken is supposed to taste like, but it seems to fit in with the Southwestern theme also found in Buffalo Flavour Hunky Dorys. 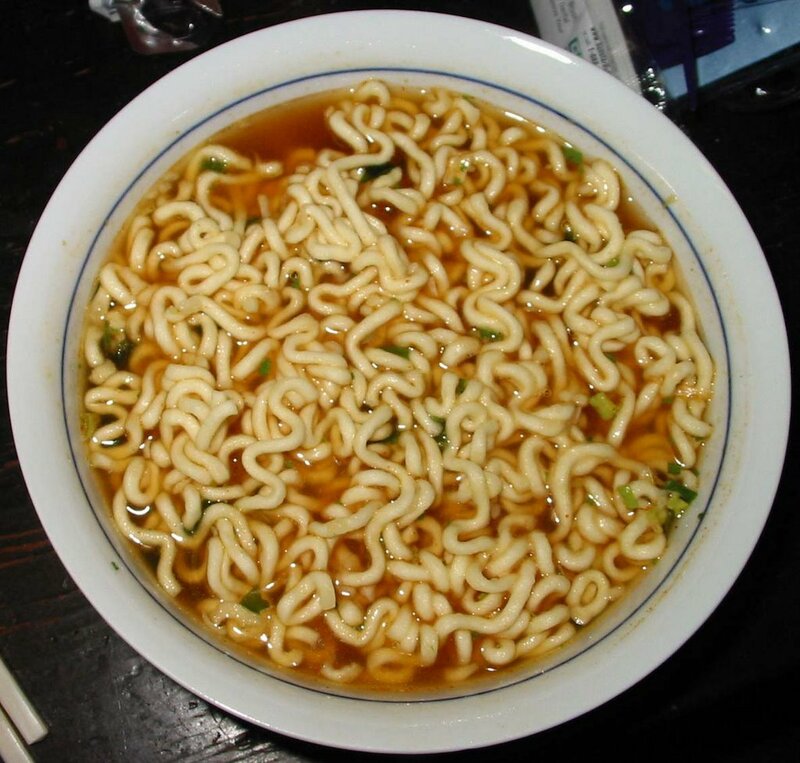 The noodles in the various Super Noodles flavours are all identical. 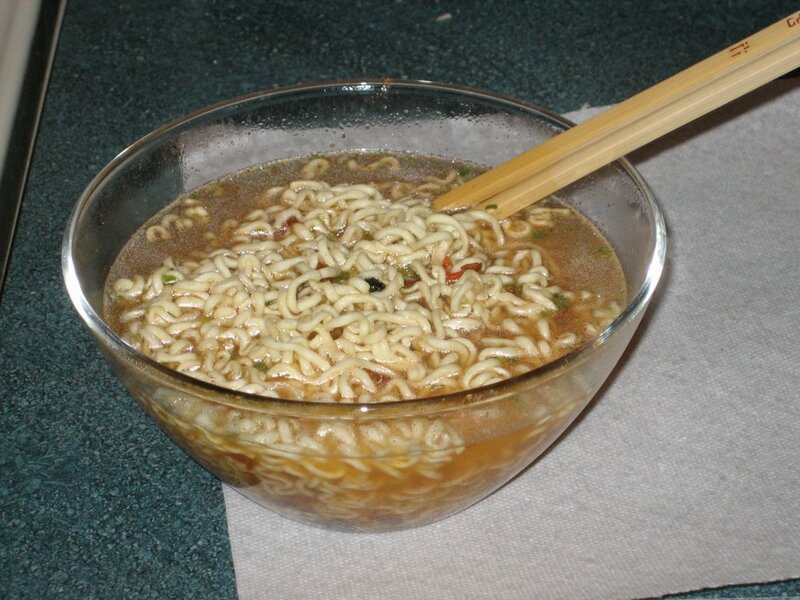 They tend to be a little slipperier and thinner than most Asian noodles, but they have a good inherent flavour. 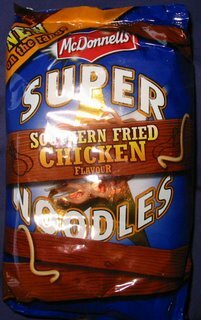 Unlike the other Super Noodles that I've reviewed, this flavour actually has a pretty subtle taste. The flavour is a little bit spicy and there are pepper flakes, but it didn't immediately bring to mind Southern Fried Chicken. Then again, I'm not really sure what Southern Fried Chicken is supposed to taste like! The flavour is decent due to the naturally good tasting noodles, but I can't help but think that they could have added a more intense flavour here. The Nissin Demae Ramen are deceptively large, weighing in at 100g. 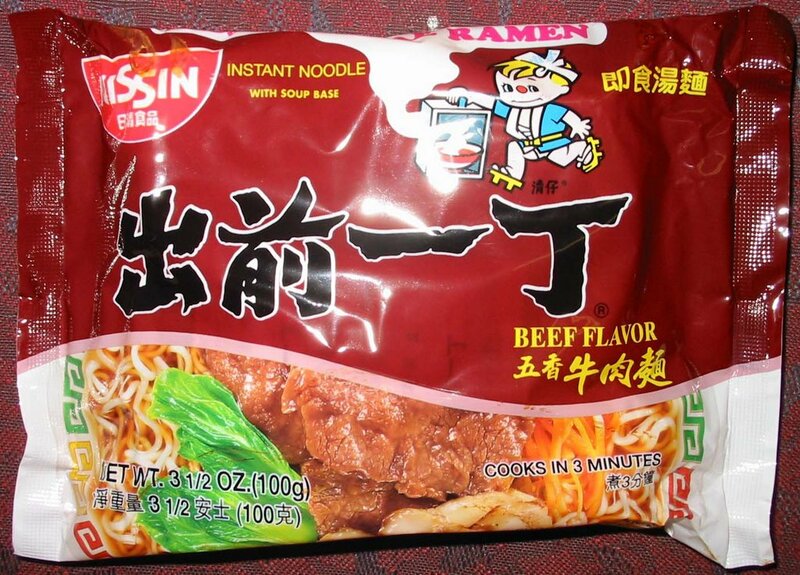 In general, this brand tends to be milder in flavor than other instant noodles. This is not necessarily a bad thing, because Nissin Demae usually pulls of their flavors pretty well. 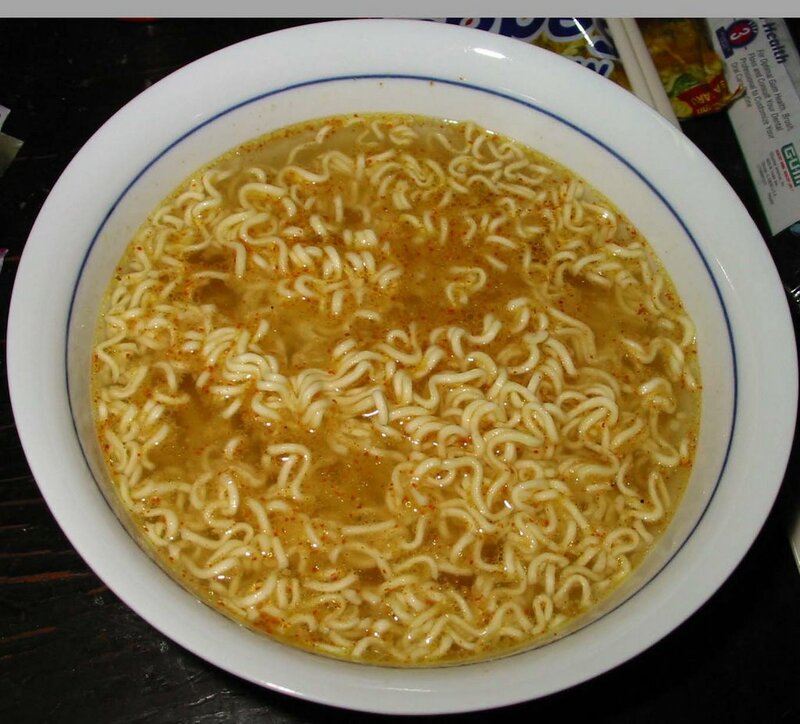 Inside this ramen are a seasoning powder and a flavored oil. As expected, the flavor was quite mild, but nice and beefy. 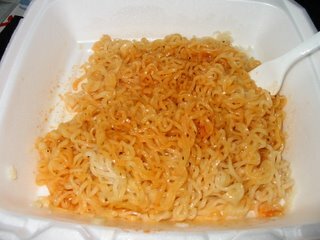 There were a lot of noodles, but they were thinner and less flavorful than I would have liked. The taste of the noodles themselves is a little bit mealy, although this effect is very subtle. I have eaten this ramen so often over the years that it is what I instantly think of when I think about instant noodles. It is fine and basic but nothing particularly special. 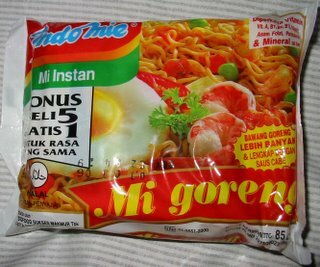 Nissin Demae is a quality brand of ramen, but I would recommend a more exciting flavor such as Hot & Spicy. These noodles from Nong Shim are the largest I've ever seen, weighing in at a goliath 125g. The cooking instructions call for preparation by a raccoon chef, but I took a shortcut and prepared them myself. The noodle block was massive, as expected. It was unfortunately square instead of round like most of Nong Shim's offerings. There was only one flavor packet and it consisted mostly of a very spicy powder. I'm not sure what Ansungtangmyun means but the soup was pretty good. There was a decent amount of seaweed, although it tends to sink to the bottom so you don't see it in the picture. 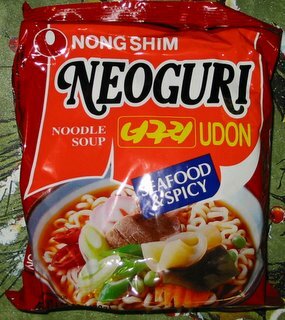 It's not nearly as spicy as Shin Ramyun and is more of a flavorful spiciness rather than a painful spiciness. The Nong Shim Kimchee Ramen is a 120 gram circular Korean ramen. It comes with two spice packets - one with vegetable flakes and the other with a red spicy powder. 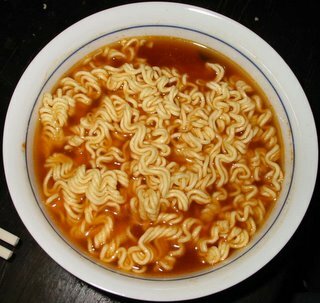 I found that the noodles take longer to soften up than most ramen noodles. They are fairly thick and dense and don't absorb too much flavor. If kimchee flavor simply means spicy flavor, then this ramen truly lives up to its billing! It tastes a lot like the Shin Ramyun Hot & Spicy, but with a softer edge. The veggie flakes include a decent amount of onion, nori, and scallion. The broth was spicy and fragrant, but not much different from Shin Ramyun or most of the Korean ramens on the market. 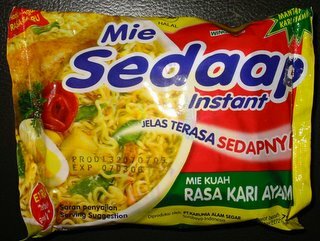 Hmm, I'm not really sure if I got the name of these instant noodles right, since there is very little English on the packaging. 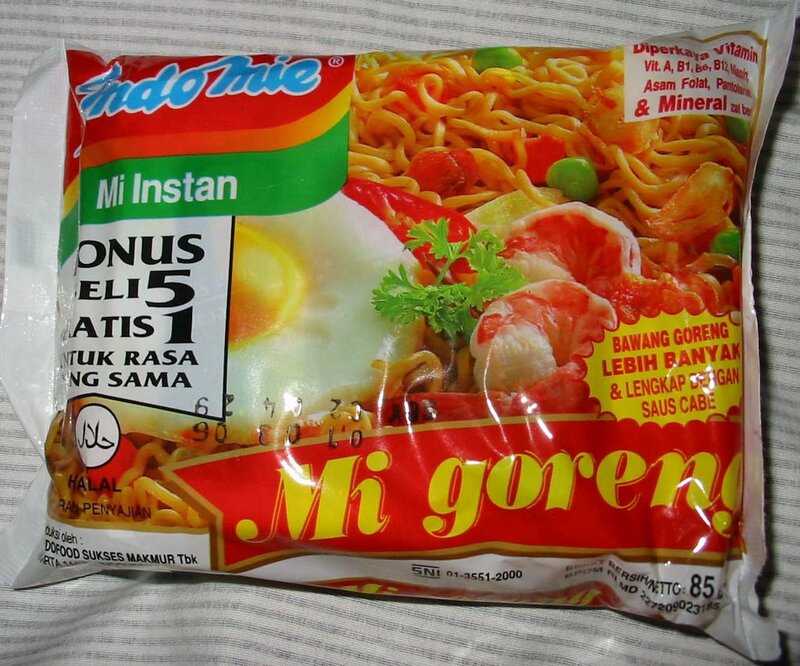 These noodles come from Indonesia and weigh in at a measly 72g. Judging by the picture, I think the flavor is supposed to be some kind of Chicken Curry, although it is hard to know for sure. Anyone know what "Jelas Terasa Sedapnya" means? At first, I was pleasantly surprised to find that there were four flavor packets inside. Usually there are only one or two, so this seemed extra special. Soon, however, my delight turned to annoyance as I discovered they could not easily be ripped open by hand. Instead, they had to be cut with scissors. And even more annoying: the oil packet dripped on my scissors, requiring me to wash them afterwards. The four packets seemed to be: seasoning powder, chili powder, curry powder, and flavored oil. It bothered me at first why all the powders came in separate packets. But after carefully reading the instructions again, it turns out you are supposed to add the curry powder last and sprinkle it over the top of everything. Whoops! But I'm sure it hardly makes any difference anyways. I guess the reason they put the chili powder separately is for people who don't want their soup to be spicy. The noodles are disappointingly small, as I had expected based on the weight of the package. The soup flavor makes up for this deficiency, though. It tastes like a lemon curry with a little kick from the chili powder. I instantly thought of Thai food, but that might just be because Thai is the closest I've ever had to Indonesian food. The blend of flavors was really quite good; almost enough to offset the small amount of noodles and the annoyances of the flavor packets. The Ramen Lovers were pleasantly surprised on a trip to Super 88 to find a new ramen restaurant! We did not have our digital camera with us, so no pictures unfortunately. Ken's Ramen is located between Super 88's food court and supermarket, near the exit to the parking lot. The decor is rather spartan and reminded us of a pizza joint with its green vinyl chairs and pressboard tables. The menu is simple. There are about five standard and two specialty ramens. 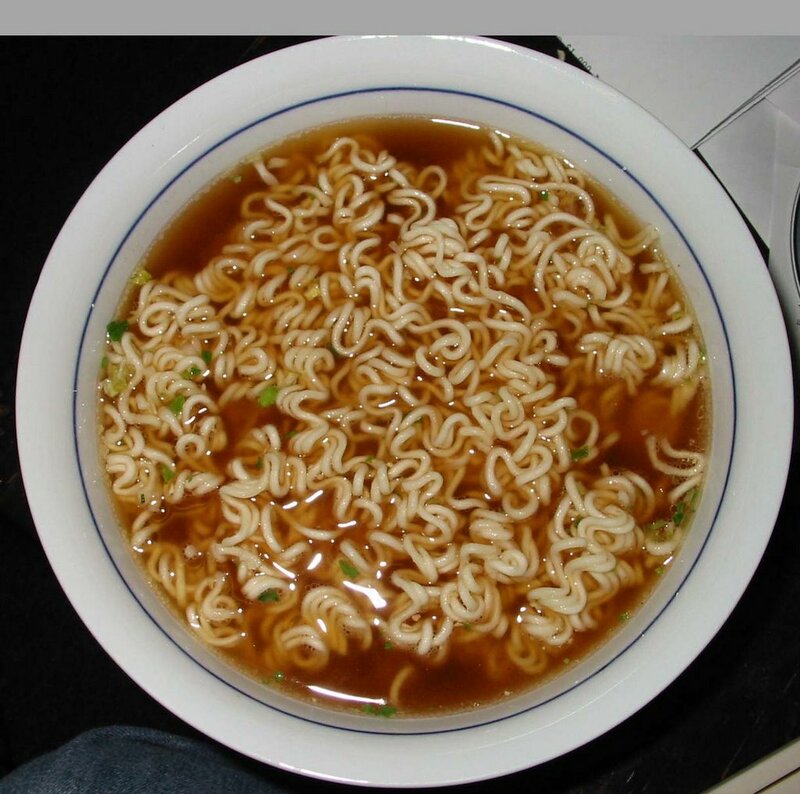 The standard ramens consist of clear (salty), miso, or soy sauce broth with various combinations of meat and veggies. We liked that the standard ramens come with a decent array of meat and veggies already included in the price ($6-$7). Add extra toppings or extra noodles for a couple bucks more. The two specialty ramens are subject to availability because they supposedly use better noodles ($9-10). The specialty clear ramen was not available on the night that we went. We did order the other specialty Sapporo Ramen, which was a miso broth with roast pork and veggies. There are also a few other items available on the menu like rice bowls. The soy sauce broth was a little disappointing because it tasted like soy sauce added to a clear broth. Not much richness or flavor to this thin liquid. The miso broth, however, was quite excellent and hearty. We didn't think the specialty Sapporo ramen was worth the additional cost, since it is essentially the same as the miso ramen. The large and extra-large sizes arrive looking the same as the normal size, but there are many more noodles hiding underneath the surface. That being said, the normal size is ample for a single person. The sliced pork was pretty good - it was roasted, not simply boiled, and quite tender. However, it was cold, and it would have been nice if it was warmed up at least a little. The veggie helpings are generous and of high quality - freshly chopped scallions, nori, and corn. 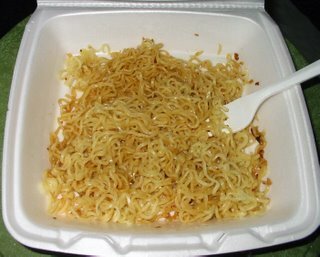 The noodles are of the yellow variety and are soft and chewy, but not especially outstanding. But, Ken's Ramen differentiates itself from Sapporo Ramen in Porter Square simply on the basis of its toppings. The best ramen so far in the Boston area. Microwave bowl of water for 3 or 4 minutes. Toss in the noodles and spices, cover, and wait for a few minutes. These noodles are Udon, which means they are thicker and chewier than other noodles. 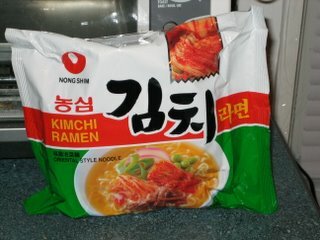 Nong Shim's strategy with their instant noodles seems to be to combine relatively bland noodles with extremely flavorful broth. This works pretty well, especially since they excel with their broth flavorings. Wow! Look at the sheer volume of noodles in that thing. To quote the Pepto-Bismol guy, "I can't believe I ate the whole thing." Actually, the Nutrition Facts on the back of the Neoguri package shows that this is supposed to be two servings. But the vast majority of people will not be sharing, I'm sure! There were a lot of seaweed flakes in the soup, which was nice. There were miscellaneous other things, like carrot, onion, mushroom, and strange fish-cake things, but the vast majority of the dried vegetable packet was seaweed, which is fine. The soup tasted like a spicy seaweed broth, which was quite flavorful and delicious. 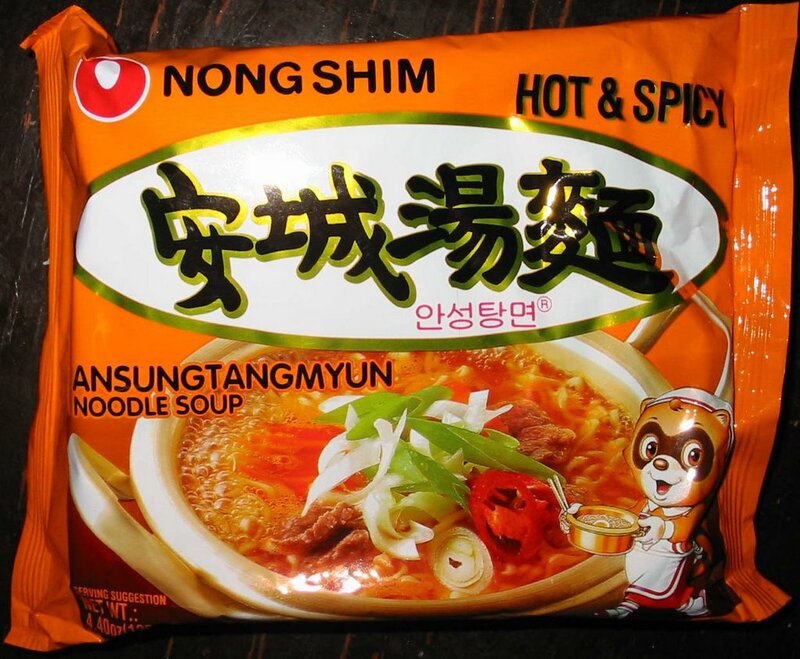 I think it's not quite as spicy as the Nong Shim Hot & Spicy, but it's close. The nice thing is that it's not an oily spiciness; this means the heat will not annoyingly linger on your tongue. Strangely, I noticed that the veggies and the spices tended to sink underneath the noodles rather than float on top like they usually do. In fact, upon reaching the end, I found a large pile of seaweed and some strange fish-cake things. Just be aware to carefully mix the concoction so that everything is well distributed. 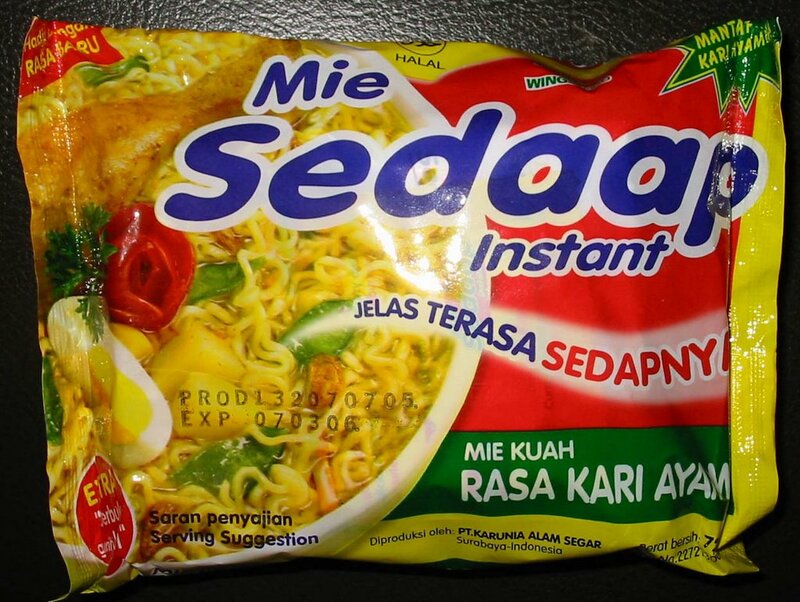 The flavor and volume of these instant noodles was quite good. Although I prefer the plain Hot & Spicy to the Seafood & Spicy flavor, they are similar and the seafood flavor is subtle and not bad. 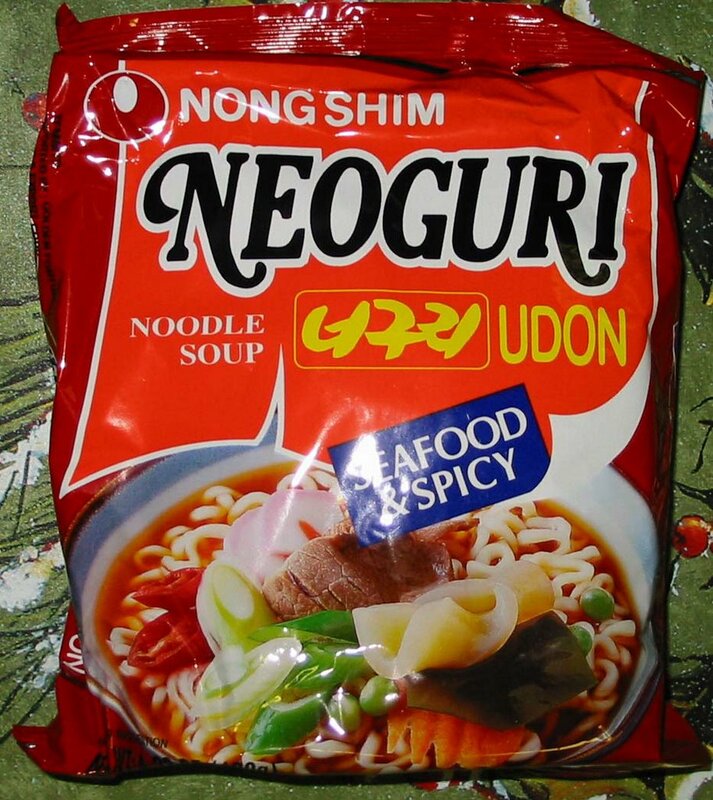 Another offering from Nong Shim that packs a punch and really delivers.